Protecting indigenous knowledge – The key to rescuing an ancient culture? The conflict between local communities and wildlife is a major global conservation issue, especially conflicts with large animals that entail direct costs to local communities, or require large areas to be set aside to minimise disturbance, thereby increasing the cost to rural communities. On communal land in north-west Namibia the successful recovery of elephant and rhino populations has been dependent on partnerships between NGOs, rural communities and state partners and the relationship between wildlife and the people who incur the costs of living with these animals. 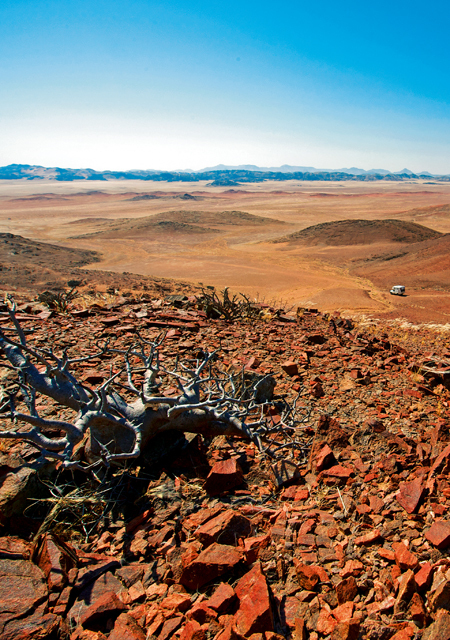 A survey conducted in three different conservancies in Namibia’s Kunene Region examined the attitudes and perceptions of the community members towards wildlife in general. They were also asked to express their opinions on the possible reintroduction of black rhino into these conservancies where they fall in the historical range of the black rhino (see graph below). the ecological and anthropogenic factors in these study sites. There was very strong support towards conserving wildlife and the reintroduction of rhino. Positive attitudes tended to be associated with education. The most support for the reintroduction of rhino was in Omatendeka (93%), followed by //Huab (87%) and ≠Khoadi-//Hoas (80%). More respondents in //Huab (15%) were concerned about the possible danger that rhinos might pose, while there was less concern in both ≠Khoadi-//Hoas (5%) and Omatendeka (5%) on this issue. 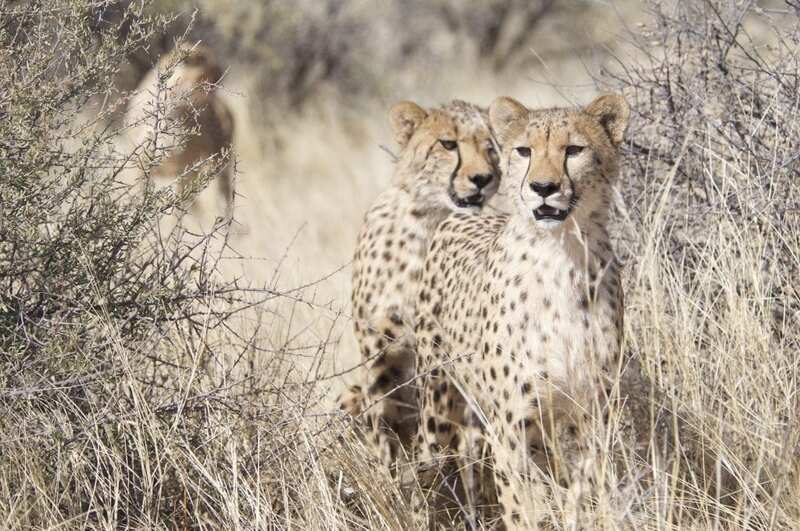 The majority of respondents in ≠Khoadi-//Hoas (57%), //Huab (73%) and Omaten-de-ka (64%) felt that conservancy committees and community game guards should be responsible for wildlife monitoring in their conservancies. However, most respondents from ≠Khoadi-//Hoas (60%), //Huab (59%) and Omatendeka (64%) felt that law enforcement should be the responsibility of the Ministry of Environment and Tourism (MET) and Police, while the role of NGOs should focus on research needs and training. The perceived incentives derived from wildlife conservation appear to outweigh direct and opportunity costs to communities in the three conservancies. Positive attitudes were associated with households that already benefit from the conservancy, and those who live next to conservancies with benefit-sharing schemes. Rhino. Photo: Save the Rhino Trust Namibia. It was also found that respondents whose family members work in tourism-related fields were very positive towards conserving wildlife. The education level, age, gender, occupation and which conservancy they are from were the most important factors influencing the attitudes of respondents towards conserving wildlife. However, some respondents were not in favour of conserving wildlife, since they do not receive any benefits from it and incur only losses to livestock and crops from wildlife, due primarily to elephant and predators. It was also realised that to examine the relationship between local communities and conservation issues, it is important to know the history of the region and also the regional politics. Adult rhino and calf. Photo: Save the Rhino Trust Namibia. Potential release sites, identified by respondents, were assessed for their habitat suitability, access to surface water and the impact of human settlements in these areas. Due to its location – close to water and further away from human population – and with suitable vegetation, the Klip River area of the ≠Khoadi//Hoas Conservancy was biologically the most favourable site to consider for reintroducing rhino. 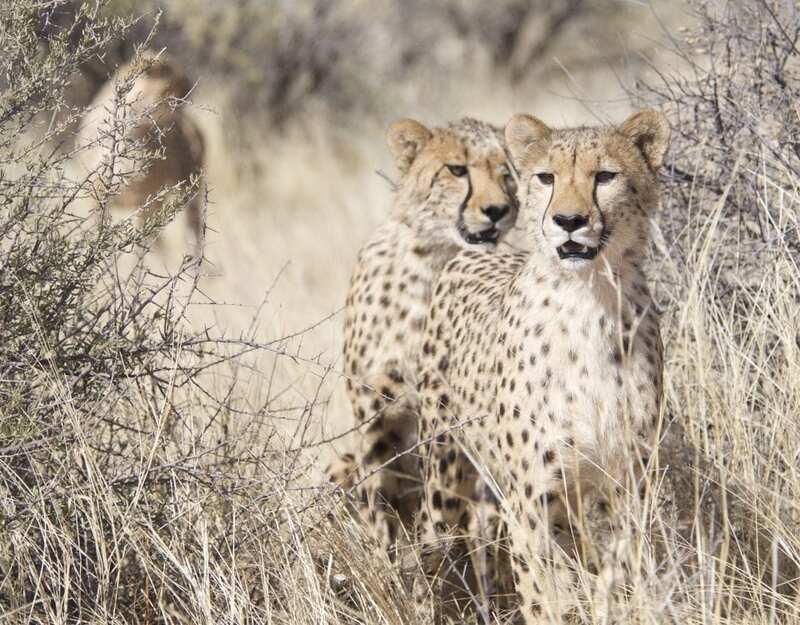 The conservancy has furthermore zoned this area as ‘exclusively for wildlife’. Based on the results of this study, the eventual choice of the first site for possible reintroduction of black rhino to the Kunene Region poses a challenge for the decision-makers in Namibia. Having examined different factors – both social and biological – that could impinge on the choice of site for possible reintroduction, the survey has thrown up contrasting results. From a habitat and disturbance perspective, ≠Khoadi-//Hoas emerges as the first area for the reintroduction of rhino to their historical range. However, of the three conservancies studied, this one was the least supportive of the proposal to re-introduce rhino, and of the need for the conservancy to monitor its wildlife. Nevertheless, with 80% of respondents in ≠Khoadi-//Hoas in favour of the proposal and only 5% viewing rhino as dangerous animals, decision-makers will have to weigh the balance of biological and social factors in deciding which conservancy to opt for as the first site for reintroducing rhino. Developing an MET and conservancy-driven protocol for stakeholder participation in rhino management to outline responsibilities for stakeholder groups in rhino management in the north west. Note: In late March 2006, the MET, in collaboration with Save the Rhino Trust, captured and relocated 24 black rhino in the Kunene Region. 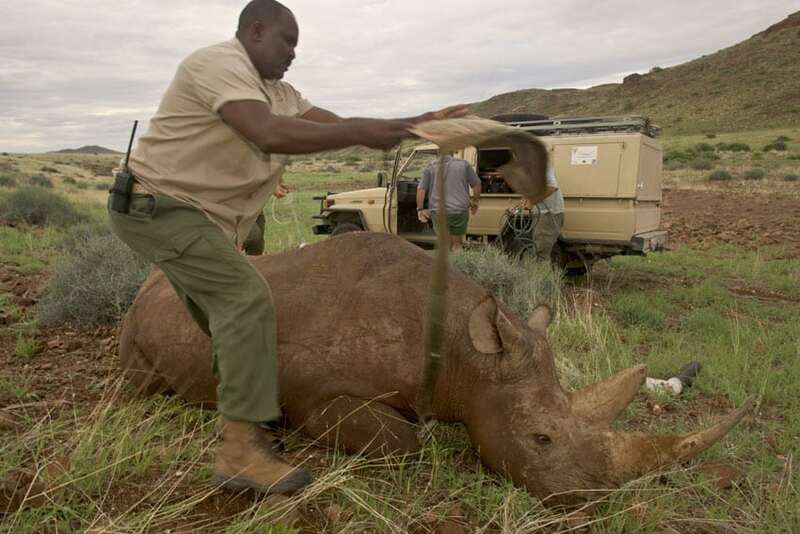 Based on the research done by Simson Uri-Khob in fulfilment of his MSc degree from the University of Kent, UK, two of these rhino were released in the ≠Khoadi-//Hoas Conservancy. This article appeared in the 2006/7 edition of Conservation and the Environment in Namibia.